Amazon has taken the first steps to solve the shipping snafu they experienced during the 2013 holiday season. 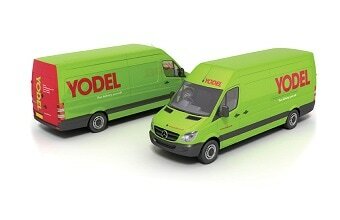 The retailer has just signed a deal to buy a 4.2% stake in Yodel, a UK-based delivery firm. The deal is going to cost Amazon around £8.7 million, giving the delivery company a value of £207 million. Yodel is primarily owned by Barclay. It's based in Hatfield, Hertfordshire, and it is reportedly the second largest shipping service in the UK (after the recently-privatized Royal Mail). It originated as the delivery division of Littlewoods, another part of the Barclay business empire, and it ships more than 135 million packages each year. Yodel owns and leases more than 5,000 trucks and employed more than 16,000 people delivering 14 million packages during the 2013 Christmas season. Amazon is not buying a controlling interest, but I would not be surprised if that were their long term goal. Amazon is one of the largest shippers here in the US, and they are probably in the top 5 shippers in the UK. But before Amazon buys the company, Yodel is going to have to do something about their customer service. A recent poll showed that 58% of customers who had goods delivered by Yodel rated the experience "bad", while only 22% reported a good experience. Luckily this is something Amazon can help fix, which might explain why Barclay was willing to sell a stake in the firm. Even if Amazon doesn't buy Yodel outright, I still think this deal is a sign that Amazon is going to launch their own shipping service. The retailer has long since grown past the point where it made business sense for Amazon to build and manage their own warehouses, and I think they could be at the point where they are shipping so many items every day that owning their own delivery service could reduce their costs and improve their customer service. Sure, Amazon's drone program and their Sunday delivery deal with the US Postal service has been getting all the press, but the vast majority of packages are delivered the old-fashioned way, and that means a delivery service with trucks and drivers. Amazon's minority share in Yodel gives them the opportunity to pick the brains of Yodel's management, which will prove useful when or if Amazon launches their own shipping service.